"Mech Pilot plays surprisingly well on the compact touchscreen"
Collect Electro energy from your downed enemies and use it to upgrade the defensive and offensive capabilities of your mech. The more you play, the more powerful and farther you will get, so keep practicing pilot! Now you can swipe left or right to jump sideways, or swipe down to evade incoming fire! Weapons include machine gun, lasers, homing missiles, ion cannon, and a sniper mode. Enemies include tanks, jeeps, helicopters, alien scouts, patrols, bombers, soldier, elite, and titan mechs. Sometimes you will be blocked and need to eliminate a single or group of enemies to proceed. The lite version includes one level from the middle of the full game. 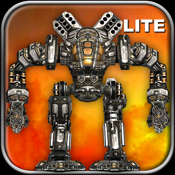 Play Mech Pilot on iPhone 4, iPhone 4S, iPhone 5, iPad 2, the New iPad, iPod Touch 4, iPod Touch 5 for a single low price. There are some reviews that are incorrect. You can stop the mech walking by pressing the currently active forward or back button. It's a toggle. There is also zoom for sniper mode by pressing the plus and minus buttons while the sniper mode is active.